especially in this case, so I am sorry if it seems at times hurried and disordered; in that it reflects the severity of the situation. Because of the huge variety and volume of coverage, I am limiting myself to few key publications, such as BBC, The Guardian, NY Times, Ha’aretz, and Al Ahram. Obviously my selection is affected my my outlook, so apologies to those who find pacifism repugnant. (Logo above left – “I am also against the Gaza War” Hebrew. Copy and paste it in your blog!). Check here to find out the up-to-date list, on the PSC site, for all parts of the UK. Singer Annie Lennox has joined high-profile campaigners to call for an end to Israel’s bombing of the Gaza Strip. At a news conference in London, she said TV footage of the attacks, which have killed more than 400 people, had left her “shaken to the core”. This is the full clip of her speaking, longer than the one above, and a long article about the context. Watch and read! The photographs on this page, on the above link, have been sent to me by my good friend Avner Faingulernt, who lives few miles from Gaza, on the Israeli side. Obviously most were taken by local residents, though I do not their names. The photos speak for themselves, and are unfortunately extremely disturbing. This is the kind of image seen by many in the Arab world, through Al Jazeera, and censored by the media barons in the west, and obviously in Israel. Would it make a difference if they were shown in Israel, together with the Al Jazeera footage? I do not for a moment believe so. Most Israelis have set their mind to the auto-pilot setting of war times, and no amount of information will change it. on the link above, you can view a small collection of the many video clips now available, describing graphically the the ongoing massacre. In the full view of the international community, and with the assent of most of it, including some of the Arab countries, Israel has started a genocidal attack on 1.5 million Palestinians, 64% of them children. This has happened after two years of blockade, in which fuel, medicines, food , water and gas were not allowed into Gaza, starving its whole population. Their crime? They do not accept the brutal occupation by Israel, after 41 years, and they believe they should elect their own representatives, rather than those Israel wants them to. Please watch and send to others! Excellent site with many clips and well up to date. Residents in northern Strip fear expansion of IDF operation, flee Beit Lahiya homes to ‘safer areas’; many areas plunged into darkness; water, sewage systems breaking down. Fighting takes first toll, claims life of one Israeli soldier, leaves another critically injured. Over 25 troops sustain minor injuries in various clashes with Gaza gunmen. 04. Januar 2009 Das dumpfe Donnern der Explosionen, das am Sonntag unablässig aus dem Gazasteifen nach Israel hinüberhallte, passte zur gedämpften Tonlage, die Politiker und Kommentatoren wählten. Ministerpräsident Ehud Olmert wandte sich in seiner ersten Rede nach dem Beginn des Einmarsches an die Mütter der Soldaten: Wäre nicht alles Erdenkliche getan worden, damit sie wieder sicher nach Hause zurückkehren, hätte er der Bodenoffensive nicht zugestimmt, versicherte er ihnen. Muere el primer soldado israelí tras nueve días de ofensiva.- Una mujer palestina y sus cuatro hijos mueren durante el bombardeo de la capital. Like The NY Times, Al Pais also found it necessary and correct to front its edition with the coffin of the ONE Israeli soldier killed in the Gaza invasion! The 500 and more Palestinians have not attained such an honour. Oh well, they are just Palestinians, and have no names and faces, of course. BALLET DIPLOMATIQUE. La région connaît une activité diplomatique particulièrement dense. Moins de 24 heures après le déclenchement de l’offensive terrestre israélienne dans la bande de Gaza, l’Union européenne a dépêché une délégation de diplomates, qui fait étape dimanche en Egypte, avant de se rendre à Jérusalem, Ramallah et Amman.L’objectif est d’obtenir un cessez-le-feu. Emmenée par le chef de la diplomatie tchèque Karel Schwarzenberg, dont le pays assume la présidence tournante de l’UE, cette mission est en outre composée des chefs de la diplomatie français et suédois, de la commissaire européenne aux relations extérieures Benita Ferrero-Waldner, et du porte-parole de la diplomatie de l’UE Javier Solana. Les Européens croiseront le chemin de Nicolas Sarkozy, qui arrive lundi dans la région pour une tournée deux jours qui doit lui permettre de rencontrer les principaux dirigeants de la région : lundi, le président égyptien Hosni Moubarak, le président de l’Autorité palestinienne Mahmoud Abbas et le premier ministre israélien Ehoud Olmert, puis mardi, le président syrien Bachar el-Assad à Damas – soutien du Hamas, avec l’Iran – et les dirigeants libanais . GAZA — Israeli troops advanced into Gaza on Sunday under cover of heavy air, tank and artillery fire after opening a ground war against the militant group Hamas on Saturday night. http://www.nytimes.com/ I prefer not to help them by showing it here. The legend, lest it be a true story, tells of how the late mathematician, Professor Haim Hanani, asked his students at the Technion to draw up a plan for constructing a pipe to transport blood from Haifa to Eilat. The obedient students did as they were told. Using logarithmic rulers, they sketched the design for a sophisticated pipeline. They meticulously planned its route, taking into account the landscape’s topography, the possibility of corrosion, the pipe’s diameter and the flow calibration. When they presented their final product, the professor rendered his judgment: You failed. None of you asked why we need such a pipe, whose blood will fill it, and why it is flowing in the first place. French President Nicolas Sarkozy told three Lebanese newspapers that Hamas bore “a heavy responsibility for the sufferings of the Palestinian people” and that its rocket attacks had to stop. Sarkozy’s comments will be published on Monday, the same day he arrives in Israel as part of the French and European effort to broker a cease-fire to end the war between Israel and Hamas in the Gaza Strip. This conclusion is inevitable in the face of a determination by the Israeli government that it faces an unacceptable threat from Gaza that must be dealt with. By delaying ground operations for a week, it gave Hamas a chance to back down and call a halt to the firing of rockets into Israel. But Hamas chose confrontation, probably fearing that to do otherwise would be to show weakness. Urgent call for action by the Gaza Universities, all of which have been bombed! Oxfam supported health worker killed and ambulance destroyed in Israeli shelling in Gaza Israeli offensive puts families’ and aid workers’ lives at risk, Oxfam warns. It calls for a suspension of the EU upgrade for Israel. The Israeli war on Gaza hasn’t been only unprecedented in its ferocity, but it has been unprecedented in the support it received from the so called “Moderate” Arab Regimes** as well. In all circles, the Israeli attack was expected but not with this ferocity, however, the open alliance between the “Moderate” Arab Regimes with the Israeli policy makers never been this clear and obvious. The only official standpoint of the Czech EU Presidency concerning the actions of the Israeli ground forces in the Gaza Strip. One is often baffled by the ironies of international relations and the alliances they foster. Take for example the Israeli colonial settlement that had declared war on the Palestinian people and several Arab countries since its inception while at the same time it built alliances with many Arab regimes and with Palestinian leaders. Last night where I live, in the central part of the Gaza Strip, we could hear bombing, artillery fire and also shooting from helicopters. I was watching from the top of my brother’s house. It was terrifying. I also went out into the streets in our area. It was virtually empty of people. EU President Czech Republic: Israeli ground incursion defensive, not offensive action. European Union president, the Czech Republic, said on Saturday an Israeli ground incursion in Gaza was “defensive, not offensive” action. “At the moment, from the perspective of the last days, we understand this step as a defensive, not offensive, action,” Czech EU presidency spokesman Jiri Potuznik said. Czech Foreign Minister Karel Schwarzenberg is leading an EU delegation to the region on Sunday, and Potuznik said the presidency will wait to see the results of that visit. However, France condemned Israel’s move to send ground forces into Gaza. “France condemns the Israeli ground offensive against Gaza as it condemns the continuation of rocket firing,” the Foreign Ministry said in a statement. “This dangerous military escalation complicates efforts by the international community and in particular the European Union and France, the members of the Quartet and the states in the region to end the fighting, bring immediate aid to civilians and reach a permanent ceasefire,” the statement said. The Czech Republic already defended Israel’s strikes against Hamas last week. At the time, Foreign Minister Schwarzenberg said Israel had the right to defend itself. Gaza medical personnel said a woman and four of her children were among the 35 Palestinians killed on Sunday during an Israel Defense Forces ground offensive in the coastal territory. The deaths came as IDF ground troops and tanks cut swaths through the Gaza Strip early Sunday, cutting the coastal territory into two and surrounding its biggest city as the new phase of the devastating 9-day offensive against Hamas gained momentum. President Shimon Peres on Sunday rejected the possibility of a cease-fire as the IDF pressed its offensive against Hamas militants in the Gaza Strip, but said Israel does not intend to occupy Gaza. A Knesset committee on Sunday approved Defense Minister Ehud Barak’s request for the call-up of tens of thousands of reservists in light of the ground operation in Gaza that Israel launched on Saturday against Hamas. Despite approving the measure, the Foreign Affairs and Defense Committee clarified that not all of the Israel Defense Forces reservists would be called up immediately. As evening closed in on Saturday 3rd January 2009 F-16 fighter planes renewed their bombing of one of the most densely populated areas of land in the world, killing more Palestinian civilians. In seven days Israel has killed over 500 Palestinians and injuring thousand of innocents. And now it has embarked on a full-scale ground invasion. At the same time as Ehud Barak was ordering the army to start the bloody ground offensive against Gaza, some ten thousand protesters from all over Israel marched in Tel-Aviv in a massive demonstration against the war. A pictorial report on this school, one of many, which was totally destroyed. A great blow against the Hamas, obviously. Douloureux à rappeler quand Israël est en cause, mais c’est le statut du tribunal de Nuremberg qui le premier a posé la définition du crime de guerre. En droit de la guerre, la césure reste l’Allemagne nazie. Les conventions internationales qui traitaient de la guerre, datées de 1899 et de 1907, concernaient essentiellement les soldats, et de manière indirecte les populations civiles. Avec les nazis, l’ordre des choses s’est inversé : la mort des civils est une réalité, et un but de la guerre. An Israeli tank shell killed three children in the northern Gaza Strip’s Beit Lahia. Ambulances are unable to reach three Palestinians who were killed in Gaza along with those injured. Thirty Israeli soldiers and more settlers from Sderot were injured. The injuries are described as “light to moderate.”Israeli source say they are fighting the resistance across the Strip. The Israeli military says that no soldiers were killed or captured since the ground invasion began. Israel’s terror tactics stop us from trying to reach the people of Gaza and doing all that we can to directly confront and challenge Israel’s violence against the Palestinian people and ongoing affront to humanity. Israeli ground forces are battling Palestinian fighters in the Gaza Strip, after Israel stepped up its operation to halt rocket attacks by militants. Gaza doctors and hospital officials said Sunday said that 19 Palestinians have been killed in Israel’s ground offensive in the strip since midnight. They said that just three of the dead are Hamas gunmen, and the rest civilians. Also Sunday, the Israel Air Force struck and wounded Husam Hamdan, a senior Hamas militant responsible for the Qassam rocket infrastructure in the Gaza town of Khan Yunis and the firing of Grad rockets on Be’er Sheva and Ofakim. The strike also wounded Hamas militant Mohammed Hilo, a member of Hamas’ special forces who helps supervise the construction and firing of Qassams from Khan Yunis. GAZA CITY, Gaza Strip – Israeli tanks and troops launched a ground offensive in the Gaza Strip Saturday night with officials saying they expected a lengthy fight with Hamas militants in the densely populated territory after eight days of punishing airstrikes failed to halt rocket attacks on Israel. Hamas vowed that Gaza would be a “graveyard” for Israelis forces. Link to the above to see fotoage of the night invasion. NEW YORK, January 4, 2009 (WAFA)- the International Security Council announced, late Saturday, that an urgent special session is to be held in the coming few hours to discuss the Israeli attack on the Gaza Strip. Palestinian President Mahmoud Abbas had called, earlier tonight, UN Secretary-General Ban Ki-moon and urged him to hold an urgent Security Council meeting to issue a resolution calling on an immediate ceasefire in the Strip. In the past eight days, 465 Palestinians were killed and more than 2350 wounded in Israeli raids on the strip. Un «nombre important de forces» militaires participent à la «deuxième phase» de l’opération contre la bande de Gaza, précise un communiqué de l’armée israélienne. LONDON – Tens of thousands of people demonstrated in European cities on Saturday against Israel’s bombardment of Gaza, including protesters who hurled shoes at the tall iron gates outside the British prime minister’s residence in London. Amid increasing criticism of Israel, international diplomatic efforts are growing to end the strikes, which have killed more than 460 people and left 1,700 injured. Late Saturday, Israel launched a ground offensive, sending tanks and infantry into Gaza. In London, at least 10,000 people, many carrying Palestinian flags, marched past Prime Minister Gordon Brown’s Downing Street residence to a rally in Trafalgar Square. 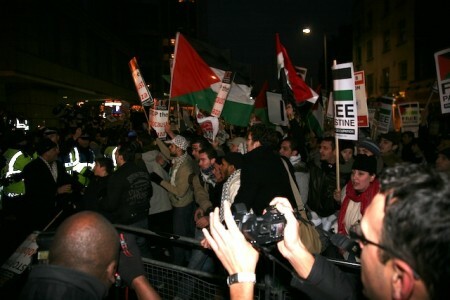 Outside Downing Street, hundreds of protesters stopped and threw shoes at the gates that block entry to the narrow road. Les eaux usées baignent les rues, le prix du pain a triplé en une semaine, les médecins craignent d’opérer faute d’être sûr de disposer d’anesthésique ou d’électricité. Sous les bombardements israéliens quotidiens, la situation devient chaque jour plus critique dans la bande de Gaza. Gaza, January 3, 2009, (Ramattan)- The Israeli attacks on Gaza entered the second week and the Israeli war planes continued on Saturday air strikes on various targets in the Gaza Strip killing and wounding several Palestinians. At least 8 Palestinians were killed and tens others wounded when an Israeli jet fighter bombarded a mosque in Beit Lahia, north of Gaza. Israël a franchi, samedi 3 janvier, une nouvelle étape dans son offensive contre le Hamas en déclenchant des tirs d’artillerie contre la bande de Gaza, ont rapporté des témoins des deux côtés de la frontière. Les tirs de l’artillerie ont commencé à 16 h 30, heure locale (15 h 30 à Paris), notamment à Beit Hanoun, Jabaliya, dans le nord de la bande de Gaza, et dans le secteur de Khan Younès dans le sud. Selon Reuters, les tirs ont provoqué une puissante explosion dans la ville de Gaza. On ignore s’il y a des victimes. 2h34 : Une réunion extraordinaire du Conseil de sécurité des Nations unies est annoncée dans la soirée. 22h08 : La France “condamne l’offensive terrestre israélienne contre Gaza” et estime que “cette escalade militaire dangereuse complique les efforts engagés par la communauté internationale” pour obtenir un cessez-le-feu, a déclaré samedi le ministère des affaires étrangères, se distinguant ainsi de la position émise par la présidence tchèque de l’Union européenne. Islamic Hamas militants in Gaza will not be short, nor will it be easy. Initial reports from both Israel and Gaza indicated that Israel Defense Forces troops had killed dozens of Hamas gunmen as they traded heavy fire upon entering the Strip. Reporting from Jerusalem — Israeli troops and tanks crossed into the Hamas-ruled Gaza Strip this evening, widening a week-old assault aimed at halting the militant Palestinian group’s rocket fire into Israel. A column of tanks, some firing their weapons, rolled into the northern part of the coastal enclave as Israeli combat helicopters flew overhead, according to Palestinian residents. Israeli television channels broadcast images of troops marching into the territory. WASHINGTON — In unleashing a series of punishing attacks in Gaza last week, Israel clearly aimed to hand Hamas a defeat from which it could not recover anytime soon. The campaign may succeed, experts here and in Israel say, but it could also backfire. Either way, the political consequences could reverberate throughout the Middle East, all the way to Iran, and help determine the ability of President-elect Barack Obama to pursue his stated goals of calming the Middle East through diplomacy. JERUSALEM — Israeli tanks and troops swept across the border into Gaza on Saturday night, opening a ground war against the militant group Hamas after a week of intense airstrikes. Pour la septième journée consécutive, Israël poursuivait vendredi son offensive aérienne dans la bande de Gaza, où le bilan des bombardements s’établit à 412 morts et plus de 1800 blessés. Des dizaines de milliers de manifestants pour le “jour de colère” du Hamas en Cisjordanie. Forze di terra israeliane sono entrate stasera in due diversi punti della Striscia di Gaza. È stata una piccola colonna di blindati israeliani a penetrare all’interno della Striscia da due località a nord, nei pressi di Beit Lahiya, lo stesso posto dove è stata colpita la moschea. Le truppe dell’Idf avanzano appoggiate da elicotteri d’attacco ma non è stato precisato sin dove siano arrivate. Israele inoltre ha posto in stato di allerta il nord del paese, in previsione di possibili ostilità anche in questa regione che confina col Libano e con la Siria. Lo ha riferito il Canale 10 della Tv. Caía la noche y la embestida de las fuerzas armadas israelíes por tierra, mar y aire, ha atronado en Gaza. La artillería ha entrado en acción por primera vez en el octavo día de la guerra para barrer la zona fronteriza de la franja de norte a sur. Buques de la Marina, cazabombarderos y helicópteros castigaron también el territorio palestino matando a una treintena de personas. Los milicianos de Hamás aumentaron la frecuencia de sus andanadas de cohetes en una batalla desigual como pocas. Poco después de las ocho de la noche, los carros de combate invadían por tierra atravesando el muro de hormigón por el norte de la franja. L’armée israélienne a franchi une nouvelle étape dans sa lutte contre le Hamas, samedi 3 janvier, en lançant une offensive terrestre d’ampleur contre la bande de Gaza. “Je peux confirmer que des troupes israéliennes sont entrées” dans le territoire, visé depuis le 27 décembre par une vaste opération israélienne, a indiqué samedi soir une porte-parole de l’armée. La France et la Turquie continuent à s’activer pour désamorcer la crise israélo-palestinienne. WASHINGTON (AFP) — US President George W. Bush on Friday urged all able parties to press Hamas to stop firing rockets at Israel and secure a lasting ceasefire, after a week of heavy Israeli air strikes on the Gaza Strip. His administration meanwhile gave Israel free rein over whether to send ground troops into Gaza, despite growing criticism over its handling of a conflict that has killed more than 400 Palestinians, including civilians. The BBC has woken up, 2 hours after the event, and is now reporting it! Demonstrators are gathered close to the Israeli embassy in London, following a day of protests across the UK against Israeli air strikes on the Gaza Strip. Up to 5,000 protesters have been involved in a stand-off with police in Kensington. Some have burned Israeli flags and thrown missiles at officers. Earlier, up to 12,000 demonstrators marched through central London, hurling shoes at the gates of Downing Street. Other rallies took place in cities including Manchester and Glasgow. As usual, th BBC heroic team is behind the police cordon! The report itself is biased and misleading. The number of 12 thousands is a joke! There were more than 50 thousands at the London March! Mohammed is burying his family. So is Jamal. Haider doesn’t feel safe in his flat so is sheltering in his car. In a series of phone calls to friends besieged in Gaza, one writer reveals the reality of life under daily attack. Ewa Jasiewicz is a journalist and activist. She is currently the project co-ordinator for the Free Gaza Movement, and one of the only international journalists on the ground in Gaza. Here is her account of a week spent trying to document the attacks. The letters page in the Guardian today, one of the best ever. Read the letters. Israel entered the second week of its offensive against rockets from Hamas-ruled Gaza on Saturday evening by launching a much-expected ground operation into the coastal strip. Israel’s government has approved the call-up of tens of thousands of reservist soldiers, it was annnounced Saturday, almost simultaneously with the launch of a Gaza ground incursion aimed at halting rocket fire on Israel’s southern communities. The UN has warned that Palestinians in Gaza are facing a serious health and food crisis, as Israeli air strikes continued for a seventh day. The “critical emergency” comes despite an increase in humanitarian shipments, said Maxwell Gaylard, the UN’s chief aid co-ordinator for the territory. The UN believes that at least 100 of some 400 Palestinians killed by Israeli action so far were civilians. The Israeli military has stepped up its attacks on Gaza, as the offensive on Hamas enters its second week. Israeli artillery and tanks bombarded the territory for what is thought to be the first time during the offensive, and further air strikes were launched. Later, a column of military vehicles crossed into northern Gaza, Palestinian witnesses said. Read this to find out the next round of fun prepared by the Israelis, which may well lead to the total destruction of what is left of the international order, such as it is. You better believe Israel when it says things like that. A week after the launch of operation “Cast Lead” in the Gaza Strip, both supporters and objectors are holding separate rallies in Tel Aviv. Well if this is the size of the demonstrations in Te Aviv, Olmert, Brak and Livni have nothing to worry about – the Israeli nation is fully behind their war crimes (HB). Thursday 1 January 2009, Paris. This is a nauseating article in the Jewish Chronicle: how to explain and justify murder and destruction! Opinion: Where’s the Academic Outrage Over the Bombing of a University in Gaza? building, about 500 meters away. I could hear glass shattering everywhere. Dr. Haider Eid reports from the besieged Gaza Strip. 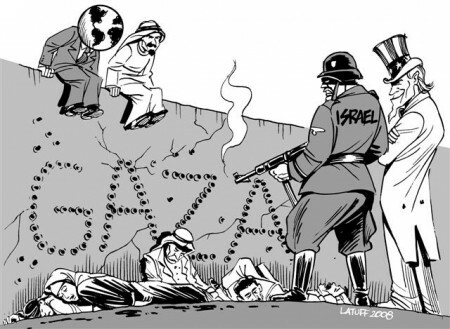 Is the UN complicit in Israel’s massacre in Gaza? The UN Security Council has discussed a draft resolution calling for an immediate ceasefire to halt the Israeli-Palestinian violence. A senior Hamas leader has been killed by an Israeli air strike on his home in the Gaza Strip, Hamas officials say. Watch this amazing film made by the Shministim! Contrary to Israeli war party propaganda in the US, not all Jews and not all Israelis support Israel’s Nazi-like conduct in the Occupied Territories. This simple fact is probably the single most censored piece of news in the United States. Here are some young people heading to prison because they won’t join the genocide. On the third day of the current round of Israeli war crimes in Gaza, two or more Israeli IDF patrol boats have tried to sink the boat Dignity, the Free Gaza vessel, veteran of delivering medicines to the blockaded Gaza. You can watch the eyewitness reports, including those of the CNN reporter on board, clearly putting the lie to Israeli claims that this was ‘an accident’. Instead, this is another example of Israel’s illegal behaviour at home and abroad, in this case operating as pirates, in international waters, 90 miles off the coast. I have put together six clips about the Dignity! The UN Security Council, meeting for emergency consultations Wednesday night, rejected an Arab request for a legally binding resolution that would condemn Israel and halt its attacks. Rafah residents came to the realization on Tuesday that the air force has adopted a new method for destroying weapons smuggling tunnels in the town. On Monday, the military fired 10 missiles which are believed to have destroyed 10 tunnels. Palestinians say IAF drones fired seven missiles on Tuesday at the same number of tunnels. An Israel Air Force strike on a home in the Gaza Strip on Thursday killed a senior Hamas political leader, Hamas security sources said. A decisive majority of respondents support continuing the army’s air campaign against Hamas targets in the Gaza Strip without endangering the lives of Israel Defense Forces soldiers in a ground offensive, according to a Haaretz-Dialog public opinion poll. There was a day when we worried about the “Arab masses” – the millions of “ordinary” Arabs on the streets of Cairo, Kuwait, Amman, Beirut – and their reaction to the constant bloodbaths in the Middle East. Could Anwar Sadat restrain the anger of his people? And now – after three decades of Hosni Mubarak – can Mubarak (or “La Vache Qui Rit”, as he is still called in Cairo) restrain the anger of his people? The answer, of course, is that Egyptians and Kuwaitis and Jordanians will be allowed to shout in the streets of their capitals – but then they will be shut down, with the help of the tens of thousands of secret policemen and government militiamen who serve the princes and kings and elderly rulers of the Arab world. Although their proposals differ in detail, two of Israel’s best-known writers, Amos Oz and David Grossman, have joined the calls for a ceasefire after several days of Israel’s offensive. Prime Minister Ehud Olmert said today that Israel was fighting Hamas with an “iron fist”, his words backed by more Gaza air strikes but challenged by rocket fire that continued to hit Israeli cities. Violence has continued in the Gaza Strip for a sixth day, after calls for a UN-backed ceasefire between Israel and Palestinian militants foundered. The Turkish public has reacted with anger to the Israeli air strikes on Gaza by appearing in huge numbers at rallies aimed at condemning Israel for the onslaught, which has taken the lives of almost 400 Palestinians. By Richard Falk. Published in The Nation The Israeli airstrikes on the Gaza Strip represent severe and massive violations of international humanitarian law as defined in the Geneva Conventions, both in regard to the obligations of an Occupying Power and in the requirements of the laws of war. From The Jewish Chronicle, by Anshel Pfeffer A most revealing article on Israel’s PR success, so far, in its war of aggression on Gaza. Note how preparations had started months earlier, refuting all current Israeli claims that their war was in “retaliation” to whatever the Palestinians have done a couple of days earlier. A boat delivering 3.5 tonnes of Cypriot medical aid to the Gaza Strip has been rammed by Israeli naval vessels in international waters, activists say. See the clip included in the news item! Israeli trade and industry minister, Eli Yishai, was forced to take cover during an interview as rocket warning sirens went off around him – watch the clip! Protests against the Israeli military action in the Gaza Strip have again been taking place, with rallies in several cities across the region. Israeli Prime Minister Ehud Olmert has rejected international calls for a 48-hour truce in the Gaza Strip to allow in more humanitarian aid. The Israeli government has created for itself a near monopoly over information coming out of the Gaza Strip. Journalists have been prevented from entering the Gaza Strip already since early November, a move the Foreign Press Association (FPA) in Israel labels “an unprecedented restriction of press freedom.” The FPA filed a petition with the Israeli Supreme Court against this measure, and the petition is scheduled to be ruled on today (31 December). The UN Security Council is set to meet to discuss the crisis in the Gaza Strip as international calls grow for a halt to the Israeli-Palestinian violence. British telecommunications firm FreedomCall has terminated its cooperation with Israel’s MobileMax due to the IDF operation in Gaza. The Israeli campaign of ‘death from above’ began around 11 am, on Saturday morning, the 27th of December, and stretched straight through the night into this morning. The massacre continues Sunday as I write these words. See what happened when we act quickly! In its efforts to stop amateur rockets from nagging the residents of some of its southern cities, Israel appears to have given new life to the fledging Islamic movement in Palestine. 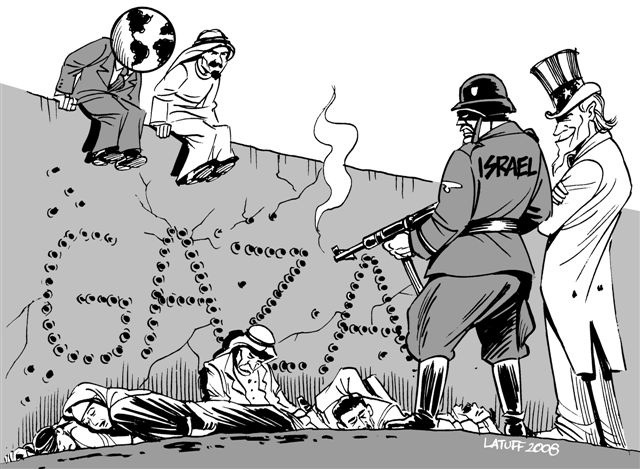 A hoorendous caricature, closely representing the current state of thinking in Israel. Please for moment do not make the mistake of thinking this is an ironic, critical reflection on the situation. Electronic Intifada: News you will not find on CNN! The best news website on Palestine, always gets thye news first. Excellent articles and reports. Foreign powers stepped up calls for Israel and the militant group Hamas to end hostilities, after four days of violence in and around Gaza. The EU must keep up the pressure for a ceasefire in Gaza, UK Foreign Secretary David Miliband has said ahead of a meeting with his European counterparts. Israel says it is ready for “long weeks of action” as it continues its fiercest air assault on Gaza for decades to stamp out militant rocket attacks. This includes a harrowing film clip. The White House has given its tacit backing to Israel’s military operation against Hamas and the Gaza Strip, a flare-up that is threatening to seriously complicate any peace efforts envisaged by the incoming administration of President-elect Barack Obama. “Of course we want another intifada,” chorus a group of female students in their late teens. For people stupid enough to believe in the humanity and liberalism of this jaded nationalist, please read to geta dose of hypocritical racism. An excellent article by the veteran journalist, who, with Amira Hass, remains almost alone in speaking the unpleasant truth about Israel’s war crimes. While lacking the moral stance of Levy and Hass, Barel nonetheless pours scorn on this mad military murderous adventure, pointing out its likelihood of failure and further, worse conflict ensuing. In this article, Salah Al-Naami, in an article written few days before the attack, is describing what might happen, though his analysis seems to be much too optimistic, as he concludes that on balance, Israel might not strike, due to the preparedness of Hams. In a typical example of skewed, faulty journalism, this is an article totally framed from an Israeli perspective. Like on the ground, so in the New York Times – the Israelis have all the lines and space, with the voice of Palestine not heard at all. The attack, they tell us, is on Hamas, rather than on Gaza. Such junk publishing is no less an enemy than the IDF, and is also more influential. A well informed Guardian article, though still using the terminology and definitions of the Israeli propaganda machine. 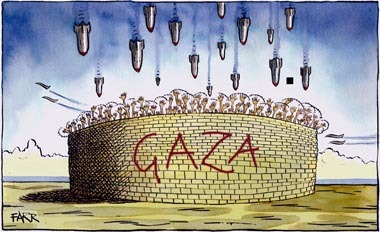 Gaza’s Guernica – Enough is enough: Statement signed by Bricup members, December 28, 2008. Demonstrate, protest, make your voice heard! 1. Join or organize emergency protests and direct actions in partnership with Palestine solidarity and social justice organisations in your area. Send reports of actions you participate in so this information can be shared with people around the world. Middle East Children’s Alliance https://secure.groundspring.org/dn/index.php?aid=1171 to pay for desperately needed medical supplies and their delivery. The current conditions in Gaza medical facilities are dire. Physicians for Human Rights Medical assistance and medicines supplied to Gaza and other Palestinian terrtories by volunteeer physicians from Israel. For information about PHR’s work, link to phr-gaza-emergency. The British Shalom-Salaam Trust (www.bsst.org.uk) is collecting funds on PHR-I’s behalf and will transfer donations and associated Gift Aid (adding 28% to their value – see below). By cheque payable to BSST and sent to: BSST, PO Box 46081, London W9 2ZF – quoting PHR-I By bank transfer to HSBC sortcode 40-04-15 – account no 11576585 – international bank account number GB22MIDL40041511576585 – please quote your surname and initial By credit card via CAF http://www.cafonline.org/apps/Charities/BasicSearch.aspx?dsp_keywords=british+shalom+salaam+trust <http://www.cafonline.org/apps/Charities/BasicSearch.aspx?dsp_keywords=british+shalom+salaam+trust> (they claim Gift Aid and deduct 5% of the total) quoting PHR-I in their instruction box. 3. Flood Israeli embassies and consulates with letters and calls decrying the attacks. Find contact info for Israeli embassies around the world. 4. Shift the framing of Israel’s actions in the media by phoning into a talk show or writing a letter to the editor. He has spoken out to condemn Israeli Apartheid and called for boycott, divestment and sanctions. 6. Write to your member of parliament. Just enter your postcode. This will connect you to your elected representatives on four levels of governemnt: Local, regional national, and European. Use all to write to your elected representatives, and try and see them to make sure they know how you feel about this issue. 7. If you are in Europe write to you MEP http://www.europarl.europa.eu/members.do Do not fail to mention the travesty of the EU planning to upgrade its relationship with Israel exactly at the point of this mass murder occurring. 10. British Embassy Tel Aviv +972 (02) 3510 1167 / +972 (03) 527 1572 Call them.